For the last three days my pumpkin is adding about 3 1/2-4 inches per day in circumference growth. Prior to that it was putting on a very consistent 5 inches per day. The pumpkin is 25 days old now so at this point of the season the pumpkin should be putting on about 4-4 1/2 inches per day in order for it to hit 1,200 pounds at the end of the season. Not that the charts mean much, but my pumpkin prior to a few days ago had been consistently on the charts for hitting 1,200 pounds at the end of the season. Because of the current growth pattern I decided to give the plant around 1/8 cup of Neptune's Fish & Seaweed (2-3-1). I don't like to give the plant much if any fertilizer when it is around the rapid growth stage (day 28 to day 40) for fear of blowing a pumpkin up but it seemed like a reasonable risk looking at the future weather forecast and how the plant has been growing. Slow and steady wins the race but pushing the pumpkin a little from time to time isn't a bad idea either. Actinovate - this beneficial organism that comes in a powder has been shown to reduce the incidents of powdery mildew. I used it for the first time last year and I could definetly see a difference. I sprayed about 1/2 gallon of water with Actinovate in it on all of the leaves of the plant this evening. Gave the plant some compost tea with a fair amount of molasses and a little Big Bloom in it. Mother nature did a wonderful job of watering this afternoon with about 1 inch of rain. You can't build a sprinkler system that can do watering as well as mother nature. I wish the weatherman could do as good a job. The 20% chance of rain and 93 degree forecast didn't help me know that I didn't need to water today. This evening I sprayed the pumpkin plant with a mixture of Calcium and Calcarb. Both are basically calcium but they are in a slightly different form. We've had some nice weather in Denver the last couple of days. Its going to get a little warmer over the next few days. This evening I built a structure over the pumpkin to help keep it cooler and dry. I drove re-bar into the ground and then stuck pvc pipe into the re-bar and bent them over the pumpkin. I then attached a tarp over the pumpkin. I need to add one more pipe but I ran out of re-bar. I haven't tried this kind of structure before but I know other growers who have and I've only got one pumpkin this year so I have to take good care of it. My white pumpkin appears to be turning orange. On the blossom end and the area around the stem orange is starting to show up. The pumpkin for almost a week was pure white but I guess dad's genetics are popping through now. Either that or my wife has been praying for orange. When I told her the pumpkin was going to be white she was more than a little disappointed. All I care for is a giant and if it is pretty then that is bonus. Yesterday evening I pulled a lot of weeds, prepped the 1789 area and sown some Sorgorum Sudan grass seed and then sprayed the better part of the patch with Biotamax, azos and Actinovate. The sudan grass is being used as a cover crop for the space that the 1789 used to be growing in. I will till it into the ground in the fall which will make a nice green manure, but more importantly for right now it will help keep the weeds down in the patch because I'm tired of pulling weeds. I also sprayed the pumpkin plant with fish & seaweed yesterday. I'm a little concerned that with the amount of water I'm putting down to keep the plants alive in this hot Denver weather that I may be leaching a lot of my nitrogen out of the soil so the foliar sprays should be helping with that. The picture below is a picture of the kids' pumpkin (924 Johnson x 1789 Wallace). I believe this pumpkin is 12 days old today. The plant is kind of small so for it's size the pumpkin is growing relatively well. They want to get over 150 pounds this year. In this picture the pumpkin looks white but it is really pretty yellow still. If you are growing a 924 please feel free to to send me photos and let me know how you are doing. This evening I did a foliar spray of magnesium on my 1451 plant. The following are of the 1451 Scherber plant and of 'Christine' the Pumpkin. She is growing at a nice consistent rate right now. Nothing to get excited about but nothing to worry about either. It is a little ahead of the 924 pumpkin that grew off the 1204 Scherber from last year in terms of size for number of days grown. For anyone that has any interest the Rocky Mountain Giant Vegetable Growers patch tour, it is on August 11th and all are invited. Start time is at 9:30am sharp and we will leave from the WiZ's house. The tour is free and there is only a small fee for lunch for non-RMGVG members. Contact me for a map and more information or visit www.coloradopumpkins.com. The patch tour will be stopping at my place. This evening I gave the plant some compost tea containing humic acid, alfalfa and Big Bloom on the leaves and the stump area. The stump of the plant I have covered on three sides with a piece of clear plastic to help keep it dry. The stumps can rot fairly easily and three years ago I was having trouble with an oozing spot on a 1161 Rodonis plant. I would bleach it and sulfur it but until I covered it I couldn't get the rot to go away. Since then I've used the same plastic piece on my plants starting around the middle of June and to date I haven't had any real problems with stump rot. However, I have to go in and hand water the stump area from time to time otherwise the dirt around the stump can get very dry and crack which can cause it's own problems. Here is the latest picture from the pumpkin patch. Right now the pumpkin is 14 days old (under the chair in the photo) and putting on a consistent 4 inches per day. As you can see in the picture the leaves are flagging some after the pumpkin. That is because the root system after the pumpkin hasn't gotten big enough yet to support the leaves and also the pumpkin is growing fast enough now that it is is sucking a lot of energy so the leaves aren't getting as much energy. The vines on this plant are still growing 8 inches a day but they should start slowing down in about a week. By then the area on the left hand side of the photo will be complete filled in and I'll terminate the vines. On the right hand side I have plenty of space because the 1789 plant is gone so I'll let some of those vines grow as much as 10 feet more and a couple of the vines I'll let grow until the end of the season so I can have young leaves and roots in September. This evening I sprayed some CalCarb with Metalosate calcium on the pumpkin leaves. Next 5 days are looking to be hot with no rain in the forecast. I'm planning on giving the plant a little extra water during these hot days. About this time of year not only are you anxious for the pumpkin to grow because you want a big pumpkin but also because you are tired of burying vines and you want the pumpkin to take off so the vines will slow down. Around day 28 typically the pumpkin has gotten big enough that it has become a sink and most of the energy in the plant starts flowing to that sink. At that time you will see the vines, which have been growing 8-12 inches a day, slow down to 3-4 inches a day. Life is easier when you can watch the pumpkin grow rather than bent over covering vines. However, having said that, burying vines right now is probably the most important thing you can do to add 200-400 pounds on the pumpkin. Those buried vines will help roots to form from the top and bottom of each leaf node and those roots will power the growth of the pumpkin, especially late in the season. Also burying the vines will help secure the vines which will reduce damage to the leaves in the wind and keep the leaves healthier later into the season. This evening I put about 120 pounds of compost under the leaf canopy. This compost will feed the plant and help keep it a little more most under the canopy. Also, by this time in the season a lot of the older vines will have the dirt washed off the vines so the compost can help rebury some of the top roots. Last season there were 17,718 visitors to denverpumpkins.com and I greatly appreciate each of you taking the time to come to the site. I've always wondered who you are and what made you decide to come to the site. Some of you leave comments from time to time but I was wondering, if you wouldn't mind, taking one minute to leave me a comment by clicking the Comment link below today and tell me where you are from and why you visited today and if there is anything you would want for me to talk about in future posts on the site. I know some of you are giant pumpkin growers who are looking for tips. I know some of you are experienced growers who come her to learn what not to do. I know some of you are friends looking for updates on the pumpkins. And I know some of you are trying to figure out why this guy is wasting all this time growing giant pumpkins and worse, writing about it. All are acceptable answers. So give me a shout out and thanks again for visiting the site! The 1451 Scherber pumpkin is now ten days old and I would consider the fruit set. This pumpkin is only a quarter of an inch from equaling my biggest 10 day measurement ever. Doesn't mean much, but you would prefer to have it bigger rather than small. I believe this pumpkin is going to end up a light orange color like it's papa with medium ribs. The pumpkin as you can see is pretty round with just a touch of length to it like it's mom had. Look at the stem on the pumpkin. Big already. I'm just hoping that this pumpkin can grow like either papa (1,725 pounds) or mama (1,451 pounds). As you can see I kind of have the vine up in the air. That is kind of by design. I have the main vine in a V shape so as the pumpkin grows it won't grow into the vine and when I moved the vine to form the V it went up in the air like that. I decided to leave it that way because it puts more slack in the vine and as the pumpkin grows up it will put less stress on the vine. I've named this pumpkin Christine after my mother-in-law. She has always been a big fan of my pumpkin growing and calls for regular updates, so I grow it in honor of her. The 1789 pumpkin was going to be named Elbert after my grandfather who was an excellent gardener, but since that plant is no more that name will be saved for next year. This evening I gave the pumpkin plant 5 gallons of foliar and drench compost tea that had about 3/4 cups of molasses in the tea. The molasses will help get the bacteria going in the soil and will help release nutrients in the soil including calcium. It is becoming more clear to me, based on the literature I've been reading, that in the few days before pollination and the week after that a quality supply of calcium to the pumpkin during those 10 days can influence the final size of the pumpkin and reduce the risk of blossom end splits later in the season. The hard part is making the calcium available to the plant. Foliar applications of calcium probably gets very little if any calcium to the fruit (although, if the leaf can absorb the calcium, it may add extra calcium to the leaf so more calcium can be directed to the fruit). Colorado's soils tend to have higher calcium levels in the form of calcium carbonate but it is locked up so the roots don't have access to much of it. My hope is that the added molasses to the soil from time to time can help release the calcium in the soil as well as add to the beneficial biology in the soil. You can get a good estimate of how much your giant pumpkin weighs with just a few measurements. The measurements are call Over The Top (OTT) measurements. After you have your measurements you can use this pumpkin weight chart to get an estimate for how much the pumpkin weighs. The chart doesn't know how thick the meat of your pumpkin is so that is why this is an estimate, but usually you can get within 5% accuracy of the weight of the pumpkin. This pumpkin growth benchmark chart can give you an idea of how your pumpkin is charting as compared to pumpkins that have weighed over 1,000+ pounds. The chart is just a benchmark and particularly in the first 20 days of growth any measurement doesn't mean much. My 20 day measurement last year was two inches bigger then the former world record 1,725 pound pumpkin's measurement on the same day. That pumpkin was one of the slowest in the patch for Christy that year but around day 30 the pumpkin finally got into gear and never looked back. At about day 20 you should start seeing some increases in size and at about 28 the growth per day should be very noticeable (25-40 pounds per day would be typical from day 30 to day 40) if you have a good pumpkin. There is an iPhone app, if you are interested, that does the weight calculations for you based on your measurements in the iTunes store. I got an email from a grower in California yesterday who said, "Thanks again for the advice and the blog. I can see from the structures, pumpkin growing is a summer occupation rather than a hobby." 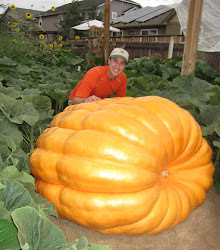 When I started growing nearly 5 years ago Joe Jutras had just grown the world record 1,689 pound pumpkin. I read an article in the NY Times that quoted his wife has saying that Joe spent about 3 hours a day in the patch. At the time I couldn't figure out how he could have spent that much time in the patch. I now know how he does that. I try to balance, work, family and Church as part of my growing, but it can be a pretty time consuming hobby. During the busiest part of the season (June and July) I spend about 2 hours a day in the pumpkin patch. During the slower parts of the season (April and September) I spend about 45 minutes a day in the patch. The following is part of my reply to the grower in California. I thought it might be a benefit to other newer growers. "The second biggest challenge in pumpkin growing (wives can be the first, lol) is that there are so many things that can go wrong. You always have to be mitigating risk and that can take a lot of time. Last year I lost a pumpkin to rot. I had been diligent every day checking for cracks in the skin (this pumpkin liked to crack) and then wiping the cracked areas with a 10% bleach solution and then put some sulphur powder on the crack. When I did that the cracks always healed. One day I noticed some ooze on the ground by the face of the pumpkin. What I discovered was that a crack had formed just below the main vine where I couldn’t see it and the rot had gone in almost two inches. The pumpkin was lost. Probably 85% of potential plant and pumpkin problems can be stopped before they happen but first you have to know that the problem even exists and then you have to know the solution. My patch was totally destroyed my second year by hail/tornado. The next year I put up hail netting and the day after the nail netting structure was completed we had a pretty good hail storm and the plants were saved. I had some damage on one plant where the hail had gotten under the netting where it came in on a slant but the season was early and I only really lost about 15 leaves. However, the process that saved the plants started in January and was a lot of hours of work. One good grower once said, “those pumpkins will meet their potential if you just get out of their way.” What he was saying is that the genetics to grow to 1,500 pounds is in the plant. If the weather is good and you do the right things so you don’t get in the plant’s way that pumpkin will meet its potential." As the title states these three things pretty much sums up my day. In honor of The Biz I gave the 1451 plant about 1/8 cup of granular Organic Richlawn along with some humic acid today. Also gave the plant some CalCarb with a tablespoon of seaweed mixed in. A good portion of the day was spent burying vines and pulling weeds because I was out of town for the better part of the week and the vines had grown 3-5 feet while I was gone. 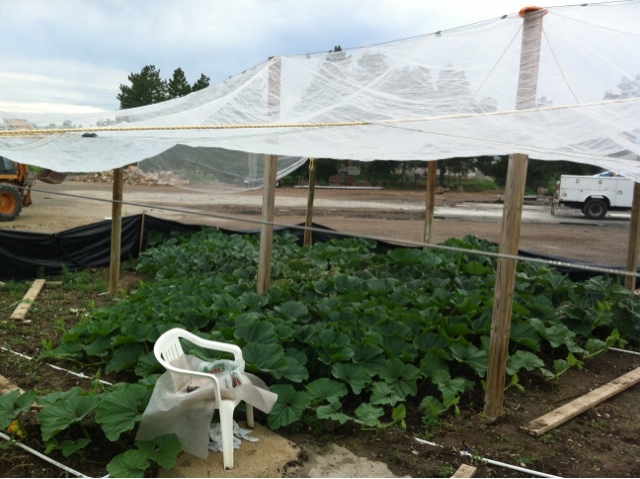 Below is a picture of the 1451 pumpkin plant. Under the chair is the pumpkin. On Monday it will be 10 days old and I'll post of picture of it then. Below that is a picture of the 1789 plant yesterday. I pulled it out today. Yellow vine disease got the best of it. Growth had completely stopped on the plant and all of the young leaves turned yellow/green shortly after that. I was in Calgary, Alberta the first part of this week and Eddy was nice enough to let me take a tour of his pumpkin patch while I was up there. I visited with Eddy at his house 4 years ago at Christmas time but he has done a lot of work in his patch since then. He took down all of his greenhouses and rebuilt everything and this is the first year with the new greenhouses in place. Eddy has a really great setup now that is going to allow him to grow big in the Great White North (although it was 90 degrees while I was there and leaf burn was more of a problem then you would expect that far north). Pictured here is Eddy's 1789 plant. Easily his favorite plant to this point in the season. Says it has given him no trouble. All of his plants are ahead of schedule this year. His giant squash plants look great and he has some recent pollinations on the vine that are already massive. Thanks for the time Eddy! We are at day six now and the 1451 pumpkin is shining up and putting on size nicely right now so it looks like this pollination may have taken. I'll feel more comfortable when we are at day 10 and I can say the same thing. It has a medium length fruit with a long and thick stem. Many of the characteristics of this plant have looked like the 1725 Clone (1161 Rodonis) except that it has the 1725 shaped leaves and green vines. As far as fruit characteristics go, I would say that I might have something of a hybrid of the 1161 and 1725 Harp. Unlike Joe's 1451 plant which is almost an exact clone of the 1725 Harp that he grew last year (big leaves, big vines and white pumpkin) my plant seems to have characteristics of both mom and pop. The good news is that mom and dad were both amazing growers, but I think I'd prefer if the genetics leaned one way or another. The 1789 plant is going to get pulled. It looks like it has gotten yellow vine disease and it is done for. Too bad because I really liked all of the characteristics in this plant and I believe someone is going to grow a big one off the 1789. Just isn't going to be me this year. Gave the 1451 some fish & seaweed, Big Bloom and calcium this evening. I think all of Denver have been enjoying the cool and rainy weather over the last few days. We got about 2 inches of rain in the pumpkin patch which is amazing considering how hot and dry it has been. I don't think we have had any measurable rain for about two months. As much as the pumpkin plants are loving this extra water the cool, wet weather does bring on the potential of powdery mildew. Usually we don't see powdery mildew until the first couple of weeks in August in Denver but to help any premature powdery mildew I sprayed the patch with Actinovate. I found last year it seems to be helpful in preventing powdery mildew so getting on it early should prove helpful later in the year. I pollinated a female flower at about 16 feet this morning on the 1451 plant with pollen from a very nice looking 1451 that Joe Scherber has. I'm really hoping this one takes because we are already 2 days past the latest I like to do pollinations. We are 85 days from the first weigh-off at Jared's Nursery and I typically like at least 90 days of growth on a pumpkin. Although there are also weigh-offs 92 and 99 days out that I can also take my pumpkins to so if this one will grow we do have options. The next week is looking like cooler and rainy weather which will be gratefully received. We've had 14 days above 90 degrees and almost half of those over 100 degrees so some cooler weather for pollination will be great. The female that was developing on the 1789 never fully developed and aborted. I've got about 12 feet of patch left that I can fun that main down so I'm still hoping for a late fruit set. If I don't get one to set then I'll make that plant a seed plant setting a couple fruit on the side vines. I gave the plants some calcium this evening along with a little Big Bloom. Both the 1451 pumpkin and the 1789 pumpkin showed up this morning looking dull. That means the pumpkins have aborted. 105 degree temperatures on pollination day can have that effect. Now I've gone from being a little too early for pollination to a little too late. The good news is, if I can get these pollination to take, because the plants are much bigger now they should make up for some of the lost time with a little faster growth early on. The bad news is that if I don't get this pollination to take on the 1789 plant then I'm not sure I'm going to get another shot. This plant doesn't like to produce females and I'm running out of space in the patch. Growth on the 1789 female has seen little to no growth, although the pumpkin is still shiny. I've never seem this before. Usually they take right off, but this time the pumpkin is only the size of a baseball after 8 days so I'm going to keep it on the vine but consider it aborted. I have another female coming on at about 16 feet in the next 3-4 days so hopefully that will will show better results. The female on the 1451 isn't showing much growth either and I'm not sure it took at all. I'll know more on that one in the next day or two. There is a female about 4 feet further out that should be opening by the end of the week. Constant 98+ degree temperatures doesn't make this easy. Looks like rain could be coming in the forecast for Denver which is great. I sprayed some Big Bloom on the soil this evening.